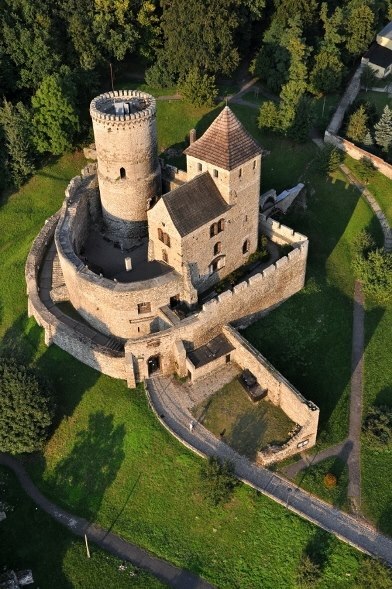 The Bedzin Castle is a castle in Bedzin in southern Poland. The stone castle dates to 14th century, and is predated by a wooden fortification that was erected in 11th century. It was an important fortification in the Kingdom of Poland. The site of Bedzin Castle was in earliest known a 10th century grod, subsequently destroyed in the 12th century. In 1228 a wooden castle with stone foundations and a stone tower was on the hill by King Boleslaw the Bashful, but it was burned by the Mongols in 1241. It was rebuilt in wood, but in 1358 Casimir the Great (1333-1370) replaced the mainly timber structure with the current masonry castle. The old stone watchtower was heightened, apparently to twice its current height, and a large square keep served as the royal residence. The inner curtain walls were 26 to 39 feet tall. A 16 foot tall outer curtain formed the middle ward. There are etchings of an outer ward with two entrance gate towers on the internet, but I've seen no sign of ruins. A stone wall protecting the town was added six years later, some of which remains.